The items we present here are for immediate purchase. 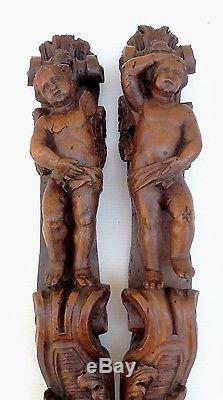 Two beautiful atlantes xviiie carved wood, louis xv era. If you are looking for quality objects. For any questions: tel 0665241111. 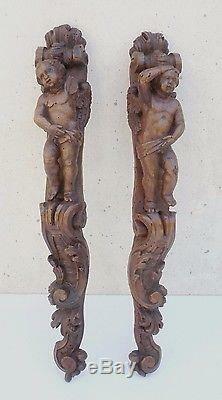 Two beautiful and long carved woods, walnut, atlantes or wall sconces, decorated with two cherubs in high relief facing each other, posing on wall sconces with beautiful rocaille. The sculpture of these consoles is of good quality. The condition is good, with wear, a few wormholes, it misses an arm to one of the cherubs. French work of the eighteenth century, old pieces, louis xv period that we guarantee. Dimensions: length 56cm x 8cm. Our guarantee commits us in the following way: we are not experts, but we refund 100%, without questions and with our excuses, any person disappointed by our sending, in the reasonable time of 15 days. No risk for our customers! The sending of this object 0 for France, and 10 for Europe. Type eclecticnimes on google, hundred of objects. 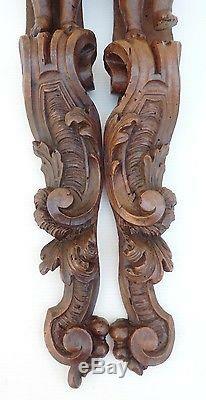 Two eighteenth atlanteans carved wood, louis xv two beautiful and long drops of carved wood, walnut, atlantean or wall sconces, carved of two cherubs in high relief facing windings are beautiful. The sculpture of the consoles is of good quality. The condition is good, with wear, some wormholes, missing an arm on one cherub. 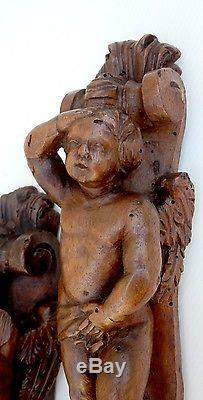 Eighteenth century working, louis xv period which we guarantee. Dimensions: length 56cm x 8cm. The item "xviiie carved wood, time louis xv two beautiful atlantes" is on sale since Thursday, December 7, 2017.